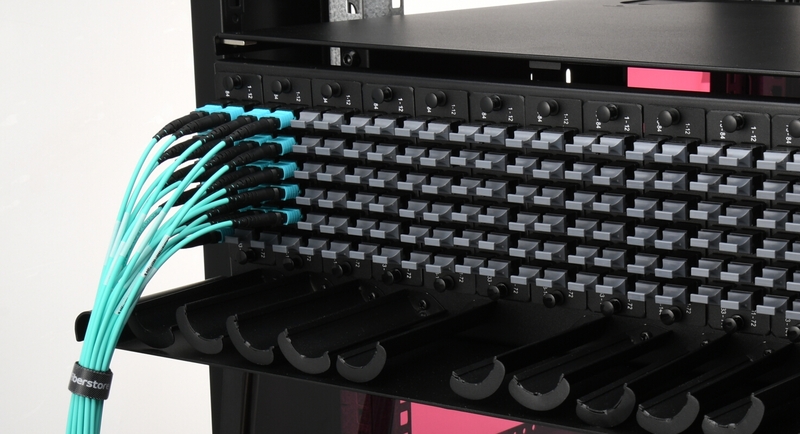 Multifiber MTP/MPO cable is a preferable choice for high-density telecom and datacom cabling. For the outer jacket of MTP/MPO cable, there are many terms to describe it, such as CM, LSZH, CMP, CMR, PVC, etc. FS.COM carries several of these technologies. Do you know the differences between them? And what are the characteristics of each type? Most importantly, which one do you need for the task? This post will introduce some major jacket types for MTP/MPO cable and the other acronyms for communication cable ratings. CMP (plenum-rated) MTP/MPO cable complies the IEC (International Electrotechnical Commission) 60332-1 flammability standard. CMP MTP/MPO cable is designed to be used in plenum spaces, where air circulation for heating and air conditioning systems can be facilitated, by providing pathways for either heated/conditioned or return airflows. 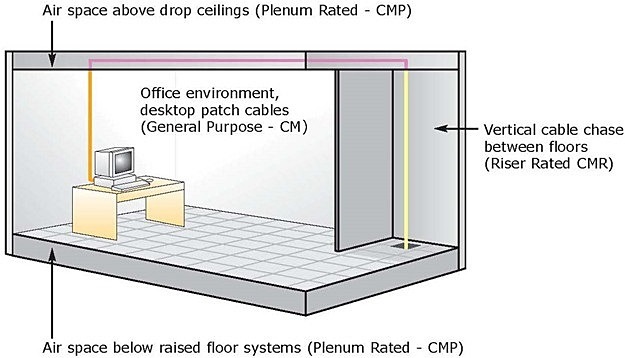 Typical plenum spaces are between the structural ceiling and the drop ceiling or under a raised floor. CMP rated communication cable is suitable for telephone and computer network exactly for this matter. It is designed to restrict flame propagation no more than five feet, and to limit the amount of smoke emitted during fire. Additionally, CMP MTP/MPO cable is more fire-retardant than LSZH, and as a result, sites are better protected. As an excellent performer cable, it is usually more costly than other cable types. It has to be noted that some CMP cable made of fluorinated ethylene polymer (FEP) still has shortcomings of potential toxicity. Thus better CMP cable with a non-halogen plenum compound is further produced. For safety reason, no high-voltage equipment is allowed in plenum space because presence of fresh air can greatly increase danger of rapid flame spreading if the equipment catch on fire. The LSZH (low smoke zero halogen, also refers to LSOH or LS0H or LSFH or OHLS) has no exact IEC code equivalent. The LSZH cable is based on the compliance of IEC 60754 and IEC 61034. LSZH MTP/MPO cable is better than other cables in been safer to people during a fire. It has no halogens in its composition and thus does not produce a dangerous gas/acid combination when exposed to flame. LSZH cable reduces the amount of toxic and corrosive gas emitted during inflammation. LSZH MTP/MPO cables are suitable to be used in places that is poorly aired such as aircraft, rail cars or ships, to provide better protection to people and equipment. LSZH MTP/MPO cable is more widely applied type than other materials, both for its secure properties and lower cost than CMP. The cable jackets will be discussed in the following part are not as frequently used for MTP/MPO cable as CMP and LSZH. CMR (riser-rated) complies IEC 60332-3 standards. CMR cable is constructed to prevent fires from spreading floor to floor in vertical installations. It can be used when cables need to be run between floors through risers or vertical shafts. PVC is most often associated with riser-rated cable, but nor all PVC cable is necessarily riser-rated; FEP is most often associated with CMP. Since the fire requirements for CMR cable is not that strict, CMP cable can always replace CMR cable, but not reversibly. CM (in-wall rated) cable is a general purpose type, which is used in cases where the fire code does not place any restrictions on cable type. Some examples are home or office environments for CPU to monitor connections. The figure below generally illustrates the applicable environments for CMP, CMR and CM rated cables. Figure 2: CMP, CMR, CM cable application. Knowing the relevant details of cable ratings of MTP/MPO will certainly help in selecting the best one for your applications, which is as important as other factors. FS.COM provides high quality plenum and LSZH MTP/MPO trunk cables and MTP breakout cables at affordable prices.